With our many years of experience in the water well industry, we have received a variety of frequently asked questions about what we do over at HWY. One Drilling Ltd. in Qu’Appelle. Read through the FAQ below to learn more about our services and capabilities! If you do not see your question listed below, be sure to contact us. We are happy to discuss your questions with you and get you the answers you’re looking for. How do you find water on a property? The first thing to do is to check with Water Security Agency water well database and find all the drilling records for the property and surrounding area. Site evaluation and the checking of services with First Call (power, gas, telephone, etc.) is a priority. Knowing the area is key to being successful in this endeavor. Is there any maintenance I need to do to my well? HWY. 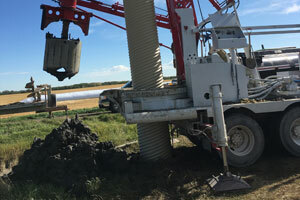 One Drilling Ltd. shock chlorinates all their wells upon completion. However, frequent testing by a qualified Lab is recommended (at least once a year). We are looking at a property and don’t know anything about the well. What should we do? The first thing that we do is check with Water Security Agency and find the water well record for the well. From that information, we can usually determine if the existing well is in good condition. If the well record cannot be found then an inspection and pump test may need to be done. If you are looking at purchasing a property, please have us check the water well condition before the purchase. It is imperative to know the condition of the well and pumping system before making your purchase.